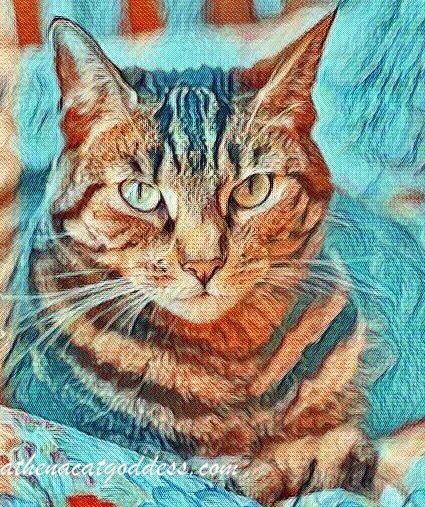 Vincent Van Gogh is one of Mum's favourite artists and when she saw this arty filter on LunaPic she couldn't resist turning me into a Van Gogh piece of art! GRAB THE LINK CODE AND SHARE! Van Gogh is one of my favorites too! I love it! Athena, you make a lovely Van Gogh painting. I love the way the blue highlights your features! I am a fan of Van Gogh too, this came out great. Van Gogh has nothing on you that is a terrific painting of you Athena. This human is quite fond of van Gogh, too, Athena. But, this masterpiece of you surpasses even his best works! So lovely. Purrs! That's a beautiful work of art, Athena. Lovely! You are very pretty in Van Gogh style, Athena! Why wouldn't you exect it to come out well? Excellent art. It's YOU in the picture, Athena ... OF COURSE it's going to come out well!!! Very cool! The mom loves Van Gogh too.